There is something magical about taking a soft piece of earth/clay and making it whistle. 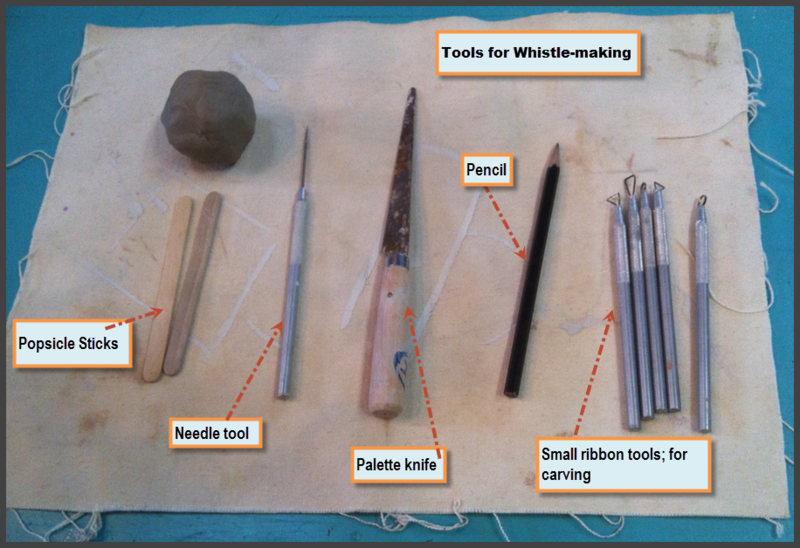 This Instructable you will walk you through the steps of making a clay whistle. round tool for making tone/note holes. carving tools; small ribbon tools and stamps for decoration/ texture. Begin with a round ball of clay. The size will determine the tone of the whistle, the larger the piece of clay, the larger the chamber, the lower the tone. Cradle the ball of clay in the palm of one hand, pressing the thumb of your other hand into the ball to open up the clay. Press until you feel pressure against the palm of your hand holding the clay. With your fingers on the outside of the ball of clay and your thumb on the inside, begin pinching and turning the ball of clay, working from the bottom towards the top. Thinning the wall of the chamber as you go. The goal is to turn and pinch in such a way that the wall of the whistle is about 1/4" thick or thinner and even on all sides. Alternating between pinching and smoothing, slowly work on the opening in the chamber until it is closed and the form is sealed. Note: You can use a small piece of clay to fill the hole, if needed. Step 3: Tap the Hollow Ball / Chamber on the Table. The bottom of the whistle needs to be flat. This will enable you to add the mouthpiece and create the bevel that a whistle requires in order to make sound. Gently tap the hollow ball of clay on the table until it is flat. Why? The next step will be to attach the mouthpiece and alter the chamber so your whistle, whistles. Clay that is too soft will be difficult to work with. Roll out a coil of clay about the diameter of your finger. One inch long. This will be used for the mouthpiece. The mouthpiece will be attached so it lines up with the flattened bottom of the whistle. Score the two pieces of clay where they join with a needle tool and smooth the mouthpiece onto the body of the whistle. Note: This is the time to trim the length of the mouthpiece, if it seems too long. Part One: Making the sound hole / Beginning the bevel. Use the sharpened end of the pencil and insert it so it creates an opening along the inside wall of the chamber. Push the pencil in far enough to create a sound hole that is the diameter of the pencil. Then tilt the pencil back, away from the mouthpiece and rock it from side to side to begin creating a bevel. Part 2: Making an airway in the mouthpiece to the chamber. You will take the Popsicle stick and insert it in the center of the mouthpiece and push it straight-back into the chamber of the whistle. You should be able to see the wooden stick through the sound hole you just made with the pencil. Part 3: Finishing the bevel. Step 7: Making It Whistle....Almost Done! When you have a bevel carved; pull the popsicle out of the airway. Clean any small bits of clay that block the airways. Gently blow into the mouthpiece of your whistle to see if it makes sound. It whistles! Congratulations! You can go on to the next step. No sound? ( Keep your chin up...this is very common the first few times you make a whistle.) Insert the popsicle stick into the mouthpiece again to clear any clay that might be blocking airways. Remember the stick needs to go straight back into the whistle. You might need to make the bevel sharper. The sound is weak or airy? - Check again for any clay that might be blocking the airway. Play around and adjust until you get a strong, clear sound from your whistle. Add pieces of clay to create bird and animal whistles. 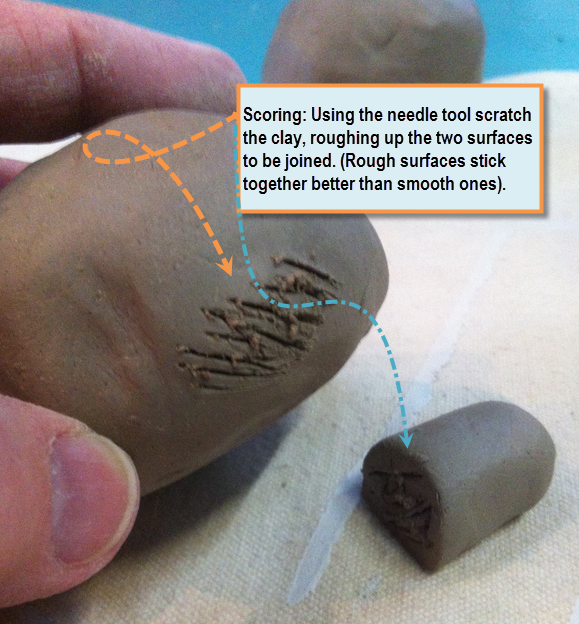 Create texture by pressing into the clay with various objects. Carve designs and patterns with small knives or ribbon tools. Additional holes can be added; depending on the size and shape of your whistle. Earthenware clay is allowed to dry slowly over about a week. Immediately after finishing your whistle, cover it loosely with plastic. After a day or so; uncover your whistle and allow it to finish drying. Firing: Earthenware clay is traditionally fired or bisqued in a kiln; to make it more durable. After the bisque you may want to paint or glaze your whistle. Use care around the bevel and airway of the whistle. The whistles shown here were made with cone 10, white stoneware clay. After they were bisqued, an iron oxide/colbalt stain was applied and they fired a second time to cone 10, in a reduction gas kiln. Moniot, Janet. Clay Whistles: The Voice of Clay. The Whistle Press. March, 1990. Mary Stone - Vermont Whistle-maker. What a wonderful Instructible! I have always been fascinated by clay whistles, and cannot wait to make one using your tutorial. Thank you so much for sharing this! I love the idea of this project and tried SO HARD with a class of 14-15 year olds to make working whistles but only 2 worked in the end. Even mine wouldn't make a tweet; I got it going once but lost the sound when trying to add features like ears and legs. Any more trouble-shooting ideas? I worried that the kids had the clay in their mouths so much because all all the health concerns with clay (dust). a question: Can this be made with air-dry clay? Great idea! Can this whistle be made with regular red school clay? I don't have access to a kiln but my clay is airdry. Great work. I will have to make one. You have my vote! I meant the lower left creature across from the bird. It is not the bear. Maybe a pig or boar ? Can you help me with this ? That whistle is imaginary; a small, fanciful rodent would be my best description. Raku is another way to fire whistles, most definitely. Fun. What is the creature in step 10 next to the bird ? I can't quite make it out ! Maybe a wild boar or pig ? My brother just told me I could "Raku" the ones want to make from clay. Then I won't need an expensive electric kiln! Can't wait to try this method. He says I need a very hot fire too. Thanks again. Very nice! The first two animals look like Aztec designs. The second ones look like eskimo type sculptures or carvings . Very nice. Wish I had a Kiln! Too big for Fimo or Sculpy. I haven't tried using Fimo or Sculpy; your comment makes me want to play around with some. It might work...keep in mind that whistles can be quite small...you'd need to fashion a smaller flat stick, to create the airway; otherwise the process would be the same for a smaller whistle. Mary Stone is a whistle maker who makes awesome, tiny whistles. Thanks, I will try a smaller version with Fimo. Love the designs! These are beautiful! I'd love to make one. I don't have access to a kiln; is it okay to not fire them? Will they just be really fragile then? That's a great suggestion. Thanks! Nice work! I have a ceramic bird whistle but it is meant to be filled with a bit of water so that you get a warbling bird sound out of it. Thanks....Glad you reminded me of this...I have an old plastic/bakelite whistle that warbles when you add water...i love the sound. 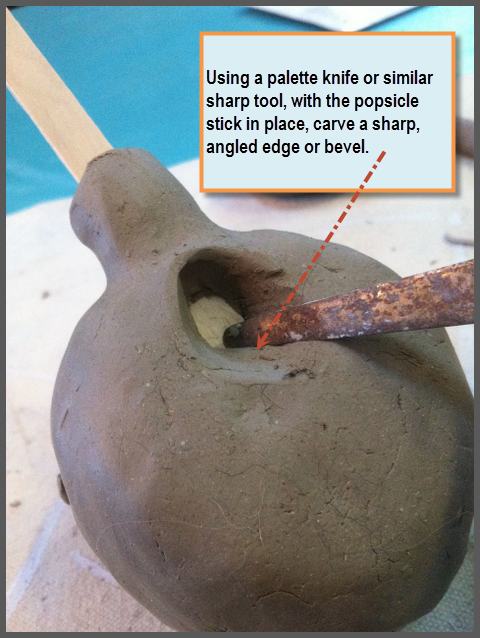 Making one out of clay would be fun challenge...there is a book, From Mud to Music, by Barry Hall that includes directions and loads of information on making these warbling whistles along with many, many other types of musical instruments.